1071 MHz engine clock for better performance and outstanding gaming experience. Dust-proof Fan designincreases particle resistance and extends card lifespan by up to 25% longer than reference. Super Alloy Powerboosts performance by reducing power loss, enhancing durability, and achieving cooler operation. GPU Tweak with XSplit Gamecasterprovides real-time and intuitive GPU clock boost, and live-stream your gameplay instantly. Raging Cool for the Win! 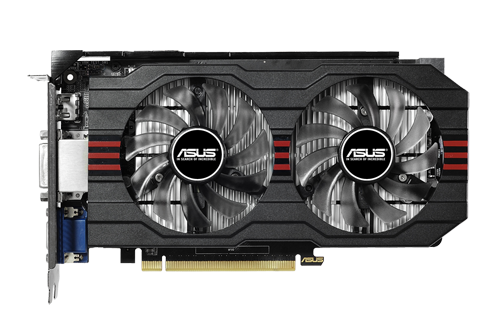 GT 740 is the astonishing new high-value graphics card from ASUS! Equipped with the GeForce GT 740 graphics-processing unit (GPU), GT 740 includes some brilliant technologies that you can get only from ASUS. We’ve fitted dust-proof fan for 25%-longer lifespan, and equipped the card with our exclusive Super Alloy Power components for superior stability. GT 740 also comes with our easy-to-use tuning tool, GPU Tweak. Use this to squeeze every last drop of performance out of the card and then stream your pumped-up on-screen action over the internet in real time! Enter your zip code, city or country to find the closest Bizgram Store near you! © 2009 Bizgram Asia Pte Ltd. All Rights Reserved.